Color(s): pepper (all shades of gray and silver) or mustard (all shades of brown and fawn). Dandie Dinmont puppies are much darker than adults. This breed of the dog is fun-loving,intelligent,a super companion to adults,easy to train if done properly and most of all good around children, if given the correct social behavior etiquette. 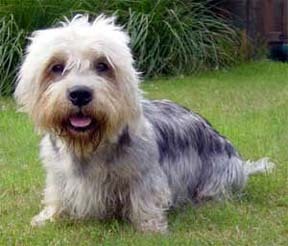 The Dandie Dinmont Terrier is a small breed of dog with an extremely long body,short legs with a unique "top-knot"of hair on the crown, that hails from the terrier family.Its life span is between 11-14 years.Its litter size is between 3-6 puppies. This breed in particular suffers from lens luxation, glaucoma and intervertebral disc disease.